We had a 'feature length' John Wagner Dredd called Judging Ralphy (with art by Dave Taylor) and I really got stuck into this and enjoyed it a lot. There is a Jimp (Judge Impersonator) loose in the city and Dredd is on his tail. It's not as simple as that though as it is a person from Dredd's past with whom he had a complex relationship. There are flashback scenes in the story, done in greyscale, and drawn in a different style by Taylor. Dredd is drawn like he was in the early Progs of the 70s and this was a clever way to handle the scenes from the past. I'm not sure everyone will like Dave Taylor's art in the main section, but the story was very good and I was absorbed. The Shimura storyline Deus X finished in this issue and I was pretty happy with how it resolved. This is another example of a story I would like to have seen built up over more episodes, but as it stands, it did the best it could. It did feel rushed, though. There are other graphic novels out there called Deus Ex Machina, the name of the Terrorists in this story. Coincidence? Or building on this universe? We are left with a little teasing 'Cliff hanger' so we will see how this builds if Shimura returns. The reprint was a Dredd called Cardboard City. 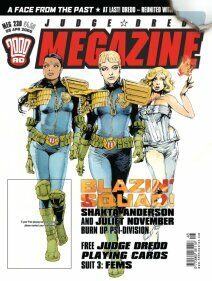 Dredd is on the hunt for his former housekeeper Maria amongst the homeless of Mega City One. But others are also moving amongst the cardboard city for other more deadly reasons. Wagner and Cam Kennedy on duty for this one and it was a reasonably good tale. I hated the colouring. I know the old strips didn't have the benefit of modern digital techniques, but I'd much rather it had been black and white. I did my best to ignore it, but it irritated a bit. When are we getting Charley's War back, Sir Alan? On to the text articles and Cam Kennedy continued to provide a fascinating look back over his career in the Interrogation slot, interviewed by David Bishop. It was interesting reading about the opportunities he perceived he missed, but he's quite pragmatic about it and doesn't seem to have any regrets. Really got absorbed by this article. In Heat Seekers, I read Si Spurrier's Movie column where he dissects all those little irritating continuity errors that creep into movies. This was a much better article and I reckon he should stick to this kind of material. Jonathan Clements reviewed an anime called Neon Genesis Evangelion in his Orient column. Sounds as mad as a box of frogs but I'm quite temped to give it a go! The Metro Dredd was nothing special. They are of some passing interest, but to be honest, if they went I wouldn't miss them. In fact, I'd be hoping they would be replaced with Wagner and Smith Daily Star Dredd!